With summer right around the corner and folks taking some vacation, Mexico is a popular spot. Matter of fact, my mother just went to a wedding at Los Cabos in Baja, California and my sister is going to Cancun for her honeymoon in a few weeks. Mexico, and Latin America for that matter, was my “first [academic] love,” the first region that I delved into while studying International Relations. And surprisingly, I haven’t talked about Mexico at ALL. This post then, is long overdue. Secretary of State John Kerry has visited 48 countries and traveled almost 500,000 miles. But until he arrived in Mexico last Wednesday, he had not visited the United States’ closest neighbors, Mexico. At first glance, Mexico has nothing going for it. It has few navigable rivers and few good natural ports (Verazcruz is perhaps the best one). To make matters worse, it has many disassociated territories, along with lots of highland jungle and deserts. This in of itself may lead you to believe that it will never be a strong state. It probably should be a failed state, but thankfully, it’s nearest neighbor is the global superpower. It has access to income and access to markets that it wouldn’t have had otherwise had it not been for their proximity to the United States. More importantly for the purposes of this blog post, it has access to a drug consuming population that it wouldn’t have had otherwise. Mexico has gone from an economic footnote, to perhaps the next big thing. And by mid-century, the country will be stronger than ever. Mexico is on track to becoming the next China. Mexico has some of the worst types of terrain in which you can develop a successful economy and culture with. Here, there are few areas where you don’t need irrigation, and unlike our chunks of arable land in the U.S., Mexico’s is much more dispersed. None of these arable chunks of land in Mexico are connected. That means any piece of infrastructure you build has to be built everywhere else, making it difficult to get any leverage. The climate also make transport issues difficult. As a result Mexico will always be capital poor with substandard infrastructure. Land Use in Mexico Most of Mexico is highland or mountainous and less than 15% of the land is arable; about 25% of the country is forested. Dark Purple: Land suitable for intensive farming, has irrigation infrastructure. Light Purple: Farm with limited infrastructure for temporary/light farming. Gray: Limited farming, no irrigation infrastructure. Brown: Farm livestock, limited infrastructure. Light gray: Suitable for farm livestock or limited irrigation project. Yellow: With or without livestock limited infrastructure for livestock. Not suitable for farming. Green: Forest with limited or no infrastructure. Not suitable for farming. 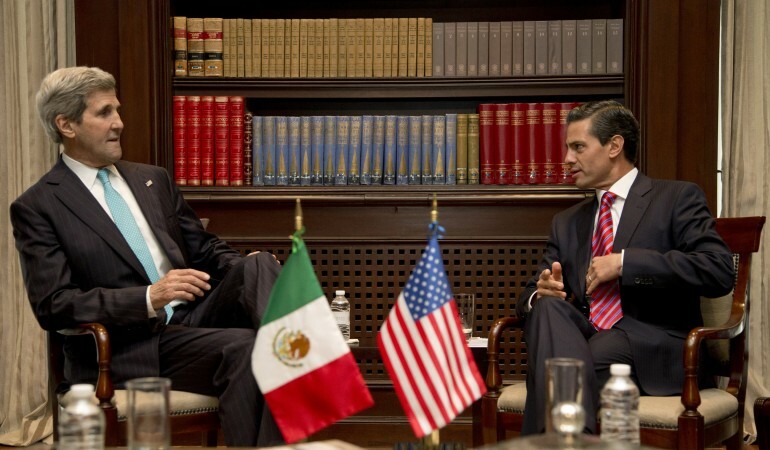 Despite all of this, Mexico will be the fastest growing economy for the next three decades. Mexico is already the world’s 15th largest economy; in the next 20 years it’ll probably be in the top ten. And that’s WITHOUT the drug war ending and WITHOUT having a corrupt government. There are certain things that are just hardwired into the system. Right now, monkeys can run Mexico and it will probably end up the same way. The United States has tripled its natural gas exports to Mexico in the last decade, and we’re going to triple that again in the next four years. There are 9 trunk-lines under construction right now with an target completion date of 2017. 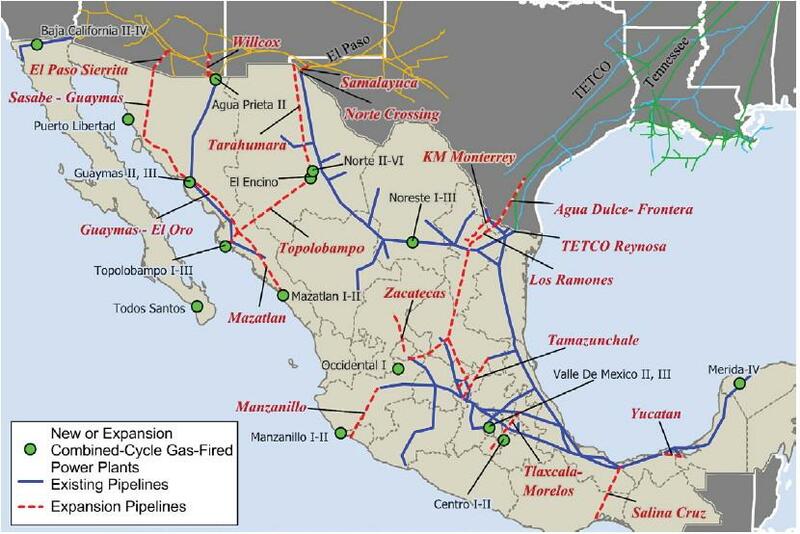 Texas won’t just be feeding Juarez with energy; pretty soon it will be powering Mexico City and Veracruz. Thank you, shale. And this is all without the recent reforms that Mexican President Enrique Pena Nieto signed into law that changes the constitution to allow foreign companies to drill for oil and gas. Mexico also has favorable demographics, with lots of young workers and a large consumption base, largely propelled by Foreign Direct Investment (FDI). And as horrible and violent as the drug war has been, it has pushed down Mexican labor costs; they are now cheaper than China’s. Anywhere else in the world this wouldn’t work very well, but because they are so close to the U.S. this labor differential works in their favor. The bigger that differential is, the more investors look at Mexico and see it as an attractive market to leverage its labor capacities to service the American market. So I know this sounds crazy, but the worse the drug war gets in Mexico, the better it is for FDI. Foreigners can come in, metabolize the cheap labor, and sell things to the U.S. because of it. This is the second largest bilateral economic relationship in human history. By 2020 I expect it to be the largest. As of right now the Mexican-American border is already the most crossed border in human history; last year it had 350 million legal border crossings. It’s not that the Americans haven’t decided if we want to integrate with Mexico, it’s that we don’t know what to do about it yet. The blue areas are the largest concentrations of Hispanic populations. 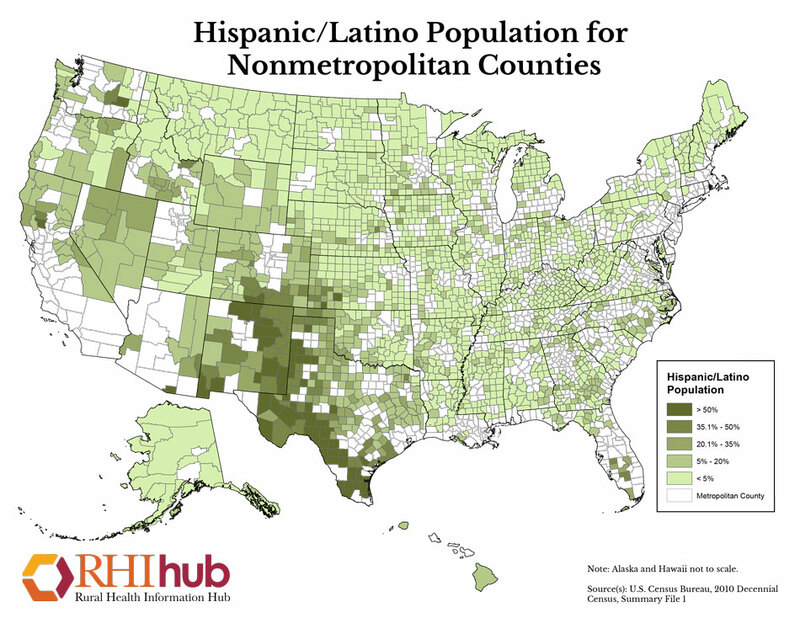 While this map is telling, not in this map are the %increases of Hispanics which are over 50% almost all across the United States. The Mexicans are the only people in the world who can WALK to the United States. In every country you have cultures that can physically transport themselves and set up ghettos en masse. Here, we only have Mexicans and Central Americans; all of our ghetto populations are Hispanic. That complicates things a little, since drug runners started entering the United States through Mexico after we effectively cut off their transit routes to Miami via the Caribbean. The problem is when the ghetto issue and the drug transport issues coalesce. Mexico’s land border with the US is 2,000 miles long. Even if the US put all of its troops on the border right now, that’s only 1 for every 50 feet. We are seeing signs of this coalescence, as well as the TCOs’ diversification and expansion. Just last week, New York City officials seized over 50 pounds of heroin that dealers were attempting to move from New England. Yes, New York City. The flood of heroin coming in and out of New York City has surged to its highest levels since 1991, alarming law enforcement who say that bigger players – like Mexican Transnational Criminal Organizations (“TCOs)– are now entering the market. You know them as “drug cartels” but I call them TCOs because they have diversified; they are not just drug-running cartels anymore. They’ve gone UP the supply chain to South America and contracted directly with the cocoa producers. And now they’re coming DOWN the supply chain to the United States. They can move anything now: drugs, money, guns, people, even oil. See, these “cartel wars” are not necessarily about drugs; they’re about transport routes and networks. It’s about geography. The logical conclusion is that this “drug war” will spill over into the United States as they fight each other for these networks. And in many ways it already has. Mexican TCOs are now the dominant organized crime group in 1,000 municipalities and operate in more than 230 American cities, from San Diego to Boston. And because we don’t have an immigration policy to integrate these ghetto populations, we’ve provided the cartels with exactly what they need to spread. And they are kicking the American gangs’ asses. In ten years time the current U.S. gangs – the Bloods and the Crips just won’t exist anymore, because the TCOs will have killed them all. They will take over retail drug distribution. And then they will begin fighting each other, just as they have been in Mexico. We are worried about Syria, Ukraine and Afghanistan, but are we prepared for Mexican TCOs infiltrating the Spanish speaking ghettos in every major city and bringing the North American drug war here? This is something I don’t think we can fuhgettabout. This entry was posted in Americas, Economics, Security and tagged Mexico. Bookmark the permalink.